We have a lovely selection of Pamper Hampers, containing natural soaps and skincare items which are perfect as special gifts. Our gorgeous lidded hamper boxes are filled with fragrant goodies and crisp coloured tissue paper, before being elegantly wrapped with organza ribbon, a flower decoration and a gift tag. A personalised message may be included free of charge (please say what you'd like printed, in the notes box at the checkout). 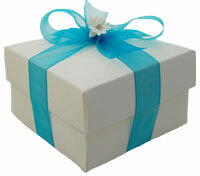 Our "create your own" gift wrapping service starts from £1.50 + the cost of individual items in each box. This allows you to customise each gift but if you're spoilt for choice, we have already created some popular hampers which may be purchased below. 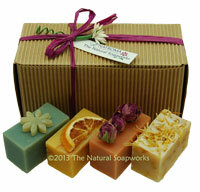 To choose the contents and create your own Pamper Hamper please email us at pamperhampers@naturalsoapworks.co.uk. Includes a 100g goats milk soap (please mention your preferred variety in the Paypal notes box, otherwise we'll send Lavender or Geranium), a wood soap dish and a bath scrunchie. 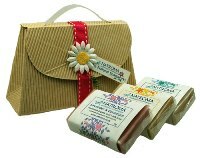 This is the perfect introduction to using our soaps in the bath or shower, elegantly presented in a 76 x 76 x 180mm recycled tube box wrapped with organza ribbon and a flower decoration. 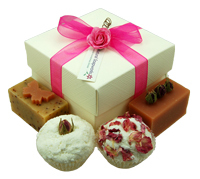 Includes 4 handmade bathing items - a mix of cute botanical mini goats milk soaps and luxurious handmade fizzing bath melts. This hamper contains a variety of floral scented items presented in a 100 x 100 x 60mm ivory hamper box. 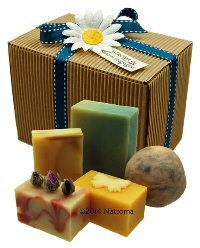 Includes 4 chunky goats milk soaps, hand decorated with prettty botanicals in our most popular varieties - calendula, lavender, patchouli and geranium. 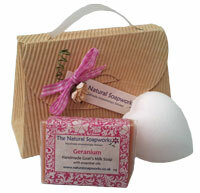 The aromatherapy soaps in this hamper each weigh between 40-50g. 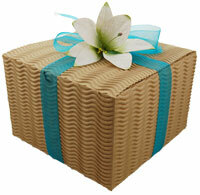 presented in a 100 x 100 x 60mm ivory hamper box wrapped with elegant stitched ribbon. 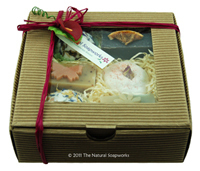 Includes a lovely selection of 5 aromatherapy bathing items - a mixture of hand decorated mini soap slices and fizzing butter melts. These are available in mixed fragrances and are presented presented in a 140 x 140 x 40mm square ivory hamper box wrapped with organza ribbon with a flower decoration..
Includes a 10ml bottle of the Monoi de Tahiti infused oil, a handmade Blue Lagoon or South Pacific 100g goats milk soap and a luxurious Exotic Flowers fizzing butter melt. presented in a 100 x 100 x 60mm ivory hamper box. 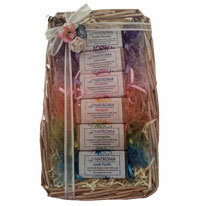 Includes 6 organic wrapped mini goats milk soaps (with pretty lace wrappings) arranged in a rainbow of colours. presented in a 240 x 100 x 40mm open wicker hamper covered in cellophane and wrapped with organza ribbon and flower decoration. 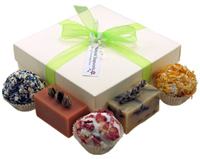 Includes a variety of 6 aromatherapy bathing items - mini goats milk soap slices or fizzing butter melts all hand decorated with pretty botanicals, presented in a 150 x 150 x 50mm recycled corrugated hamper box with a cellophane window wrapped with raffia and a lily decoration. 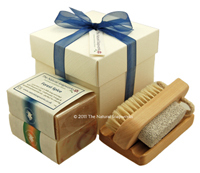 Includes 2 100g goats milk soaps (Herbal Zest and Patchouli) wth a wooden soap dish and a nail brush. 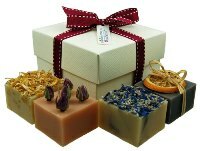 Although we have listed this as a male gift set, we can also supply this hamper with other soap fragrances - simply state your soap preferences at the checkout, presented in a 100 x 100 x 90mm ivory hamper box wrapped with navy organza ribbon. 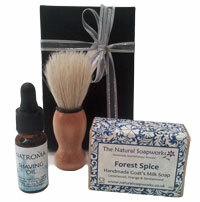 Includes a 100g Forest Spice goats milk shaving soap enriched with rhassoul clay, one of our new Natroma Shaving Oils and a wooden shaving brush. The Natroma Shaving Oil is supplied in a Miron violet glass pipette bottle, and is a rich blend of botanical oils specifically formulated with skin calming botanicals to make it easier to get a close shave. Subtle male packaging presented in a 130 x 90 x 40mm black hamper box. Includes a 10ml rollerball bottle of Monoi de Tahiti oil, a handmade 95g South Pacific goats milk soap, a scrunchie, a fizzing bath melt (hand decorated with petals), a large bath bomb. This unusual hamper is wrapped with an organza ribbon and decorated with a large exotic flower decoration and presented in a 150 x 150 x 100mm recycled kraft crinkle hamper box.